Team Rush Videos Are Here! 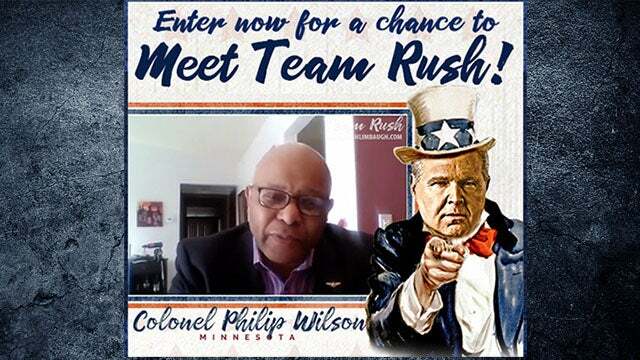 RUSH: For the past couple of days, week, I have been urging those of you to participate in a new feature we’re running at RushLimbaugh.com. It’s a member-side feature. And it is built on a plan to reach out and have more contact with people in the audience. I simply don’t take enough phone calls each and every day to have direct contact with the audience. So we call this Meet Rush. And you can find it on our home page at RushLimbaugh.com. You’ll see an iPhone graphic or an iPhone icon with a home page of icons, and in the lower-left hand corner is an icon called Meet Rush. If you click on that, you are opened to a vista where you can apply to be contacted by us via video conference to make comments as you want about the program and to ask questions for me that you might have had for a number of years and had no way of asking them or getting them answered. We have been conducting these video interviews with members of you in the audience who have entered this and have qualified. And we’ve talked to a ton of people. And this is gonna be an ongoing thing. We’ll occasionally play videos of the people and their questions and my answers, and we are debuting that today. And I just wanted to explain it a little bit. It varies the number of people we talk to on a weekly basis, but these are video chats that we set up with people. You’ll see how you enter when you hit the Meet Rush icon there on the little iPhone. And if you end up being chosen by us, we’ll arrange a meeting where we will contact you by video conference. I was saying yesterday that one of the families that wanted to participate actually delayed a family funeral in order to have the video conference with us. We found yesterday or the day before a woman who is doing mercenary work — now, get this — this woman is doing missionary work in Papua New Guinea, and where she lives there’s no electricity. Every day she goes up to the top of a hill where they have a 2G cellular signal, she takes her phone up there, she charges it up there and she downloads the daily podcast of the program, goes back down the hill and listens. She’s doing missionary work in Papua New Guinea at a place there is no electricity. She’s making that effort. I saw this when I was on my troop visit to Afghanistan. There are people who live there who still have to climb a 500-foot hill to get water or go down a hill 500 feet to get water, bring it up to where they live. The incredible stories like this that we are encountering with this feature, the things that people who listen to this program do, the kind of people they are, the demographic shift, it’s just mind-boggling. It is one of the greatest features we have ever implemented. It’s working out much better than we ever dreamed it would. And you can apply any and every day. Just hit that Meet Rush button and follow the instructions on the page, and you never know; you may hear from us and we’ll have a video conference. So today we’re debuting the feature and you can either click on the Meet Rush icon or right there on the home page it says Meet Rush is up and running, just to the left of the phone icon. It’s a video of me and a guy with his question and his comments and his history as a listener and so forth, and some other things in it. But I just wanted to let you know it’s up and running. It’s a member-side feature. I want to be honest with you about that too. It’s a member-side feature. There are production costs with doing this feature, but it’s all rooted in the fact that I have always known of the tremendous familial type relationship that I have with people in this audience, the bond. I know it exists, which is why and how I was able to see it with Trump. My experience with you and doing this program is what informed me tremendously on the relationship Trump has with his supporters and his voters. And although he hadn’t been at it in this form as long as I have, I was still able to recognize it. So I just wanted you to let you know it’s up and running, and any time you have time, you can go click on it and take a look at the first video that we’re posting. It has this guy, a typical listener and his question and my answer. It has a setup by me explaining what this is all about, with the indication that you can be part of it, too, if you want. This week we’ve been busy. We’ve been talking to three people a day. And I think we’re talking to five or six more tomorrow. And then we take those and we edit it down further and decide — when I got it last night, they sent me a list of like 50 questions to answer that people who are participating want to know. And I’ll tell you, none of these questions I’ve ever been asked when I’ve been interviewed on TV by a seasoned professional journalist. And I answer the questions whether we do a video on them or not. You do get your questions answered. That’s the point. It’s a thank-you, it’s an outreach plan. It’s just an acknowledgment here that the appreciation for you being there is deep and profound. So RushLimbaugh.com. To submit, to apply hit the Meet Rush icon on the iPhone graphic, and then right to the left of that you can click and watch the first answer, submitted question and answer with me and the questioner on video.